Back in February I made Red Velvet Slutty Brownies for Valentine’s Day, and I decided to do another take on the infamously scandalous chocolate chip cookie/Oreo/brownie combination for a friend’s birthday. He loves over-the-top desserts as much as I do, and I knew a cake like this would be perfect. As I’ve said before here on the blog, when I’m baking for a birthday I really do prefer serving things in cake form. Whether it’s cookies or brownies, everyone deserves a cake on their birthday, even if they’re just cookies stacked together to look like a cake. Or brownies baked in a cake pan instead of being cut up into squares! Of course once it gets sliced up it’s the same thing, but blowing out candles atop a “cake” just seems more appropriate. 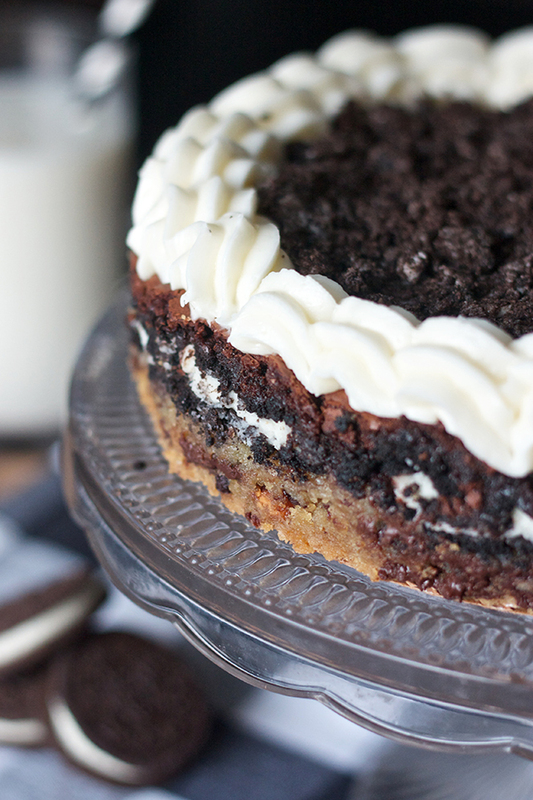 So for this treat I simply baked the cookie dough, Oreos, and brownies in a 9″ round cake pan instead of a 8×8″ square pan and topped it with crushed Oreos and a ring of buttercream. I used a paring knife to cut off the outer ring/crust of the cake because I wanted to make sure the Oreo layer could be seen from the sides. And of course you get a great view of the gooey chocolate chip layer and deep chocolate brownies. I was a bit lazy this time around and used boxed brownies instead of making them from scratch. The great thing about this recipe is that if you too don’t have time for multiple homemade components, a storebought cookie dough, brownie mix, and frosting will all do the trick. It’s an absurdly indulgent (hence, slutty) and delicious cake/brownie/cookie masterpiece that will make any special occasion even more special. It’s a no brainer that the components are heavenly together. Of course a tall glass of milk or scoop of ice cream would be highly recommended to balance out all the richness, and you’re not going to need a large slice. If you’re in charge of slicing a cake like this, I would probably recommend very thin slices, or get creative with your cutting (kind of like this) to make sure no one goes a diabetic coma. And sorry again I didn’t get more photos of the cake for the post, or a picture of it all sliced up, but I couldn’t imagine not sharing this idea with you just because I was short on photos, so I hope you understand! Preheat the oven to 350 degrees. Liberally spray a 9" round cake pan with non-stick spray. Set aside. In the bowl of an electric mixer, beat together the butter and both sugars on medium high speed until light and fluffy, about 2-3 minutes. Add the eggs and vanilla and beat well, scraping down the sides of the bowl as necessary. In a medium bowl, whisk together the flour, baking soda, and salt. With the mixer on low speed, slowly add the flour and mix until just incorporated. Add the chocolate chips and mix in by hand with a rubber spatula. Transfer cookie dough to prepared pan and press evenly to cover the entire bottom. 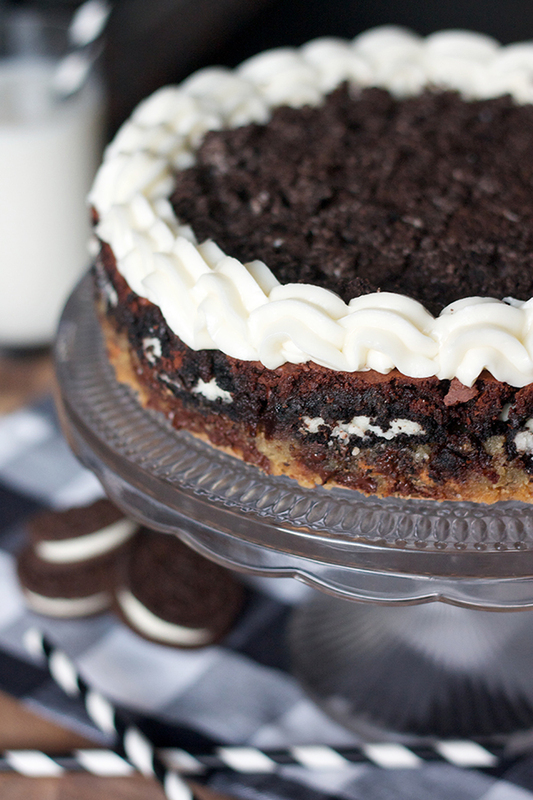 Top with a layer of Oreos. Prepare brownie batter according to the package's instructions (or you own homemade recipe) and spread batter evenly on top of the Oreos. Depending on your box or recipe you may have extra, but fill up the pan only until there's about 1/4" of pan left above the brownie batter. The cake will rise as it bakes, and it may puff up beyond the pan a bit, but then deflate later so don't worry. Place the pan in the oven and bake for about 30-35 minutes, or until a cake tester comes out clean. Allow the cake to cool in the pan for 20-30 minutes, then use an offset spatula to gently release the cake from the sides of the pan. Invert cake onto a wire rack to cool completely. To make the buttercream topping, beat the butter in the bowl of an electric mixer on medium-high speed until light and fluffy, about 2-3 minutes. Add the cream cheese and continue beating until smooth. Reduce the speed to low and add the powdered sugar. Add the milk, then gradually increase the speed back to medium-high and beat for another 2 minutes. Transfer frosting to a piping bag fitted with a large star tip. If you want to have an exposed edge like I did, you'll have to use a sharp paring knife to cut off the "crust" of the cake. 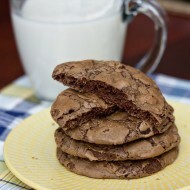 Otherwise the cookie and brownie batter covers everything up on the edges. 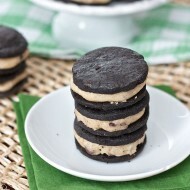 Once you've trimmed the cake, spread a thin layer of frosting over the top of the cake and sprinkle on the crushed Oreos. Pipe a border of buttercream along the edge. Store in the fridge, and take it out about 20 minutes before serving to soften up a bit.